Central New York played a key role in the economic development of our nation. Today, the original routes that carried the Industrial Revolution to every corner of the country have been covered over by pavement, submerged under the Empire State’s canal system, or left to nature. Fortunately, the builders of this massive ancient infrastructure did their jobs well–so well, in fact, it’s gonna take natural succession a long time to hide the evidence in the portions that were simply abandoned. And while that might goad the sensibilities of purist environmentalists who feel smug sitting around thinking and talking a lot, it’s a God-send for average folks looking for cheap ways to recreate and exercise in the open air. You see, nowadays these forgotten routes etch the state in a web of paths lined in natural splendor, offering folks scenic avenues through the historical record. 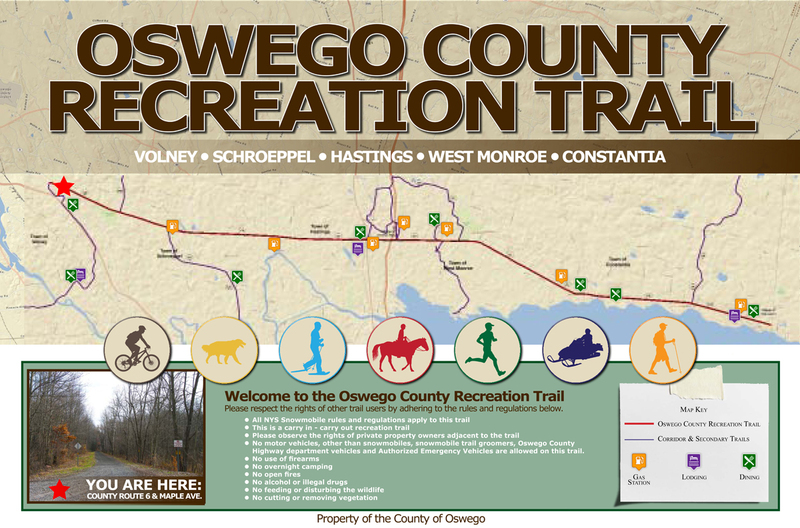 Take the Oswego County Recreation Trail, for instance. Running the bed of the New York Ontario & Western Railroad (abandoned in 1957), it’s the easiest, most convenient path you can take through our past. Stretching for roughly 26 miles, from Maple Avenue in Fulton to a little east of North Street in Cleveland, its gentle grade is ideal for hiking, biking and snowmobiling. The OCRT is actually two trails: the western arm reaches from Fulton to Central Square, where it’s blocked by Interstate 81 (the highway was built after the railroad was abandoned, and no one thought of tunneling the trail under it); the eastern stem picks up on the other side of the interstate, about 1000 feet west of CR 37, and runs all the way to the county line in Cleveland, beyond which it becomes rutted and beat as it continues for a short distance into Oneida County. In Oswego County, the well-maintained path slices through a patchwork of developed and natural areas. And while the scenery along its entire length is worth the trip, the eastern section is longest and offers the most diverse habitats. Spawned on its west end at a dented guardrail preventing vehicles from going over the edge of the demolished railroad bridge over Little Big Bay Creek, the east branch cuts through agricultural fields and pastures, skirts woods and small parks and crosses creeks and brooks, offering a menu of splendid scenery, including golf courses, Toad Harbor Swamp, the dam on Scriba Creek, (just upstream of the Oneida Lake Fish Hatchery), thick, dark forests, scenic back-country beaver meadows, even a backyard pond in Cleveland that sports its own bridge over a feeder brook, and a cannon protecting it. Access is easy. From CR 37 to the edge of Constantia, roads heading south off NY 49 cross the OCRT; and there’s parking at the shoulder of Toad Harbor Road. On the east side of the village, the trail crosses NY 49 and, from here to its end, is accessible by all roads heading north from the highway. In Constantia, shoulder parking for about 10 cars is off Hatchery Road, a few hundred feet north of the NY 49 intersection. East of the hamlet, parking is allowed on the shoulder of some cross-roads and North Street. The trail gets a little tricky in Cleveland. On the east side of its junction with Center Street, the OCRT widens, turning into Sand Street. But a few hundred feet later, on the other side of North Street, it assumes the charm of a trail agaiin. Snowmobiling, cross-country skiing and horseback riding are also allowed on the trail. Motor vehicles, other than snowmobiles, trail groomers, Oswego County highway equipment, and authorized emergency vehicles, are prohibited from the trail. ATVs are only allowed on the eastern-most section of the trail between Toad Harbor Road and the Oswego-Oneida county line. At press time, coils of gray and white rolled over the barren, late autumn landscape lining the OCRT. Soon, hopefully before Christmas, winter will shroud this natural canvas in sparkling snow punctuated with ice, adding frosting to the Holidays.